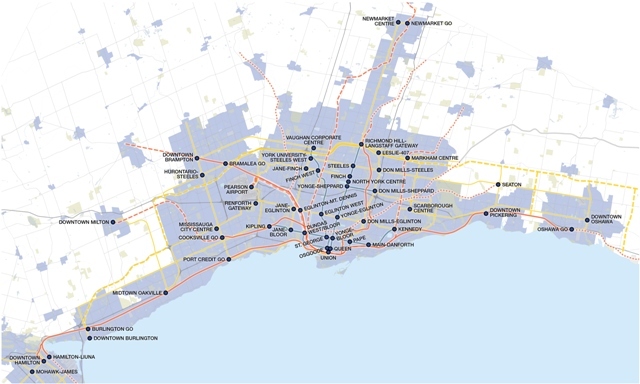 The Mobility Hub Profiles, available below, provide an insight into each of the 51 mobility hubs identified in The Big Move and the interaction between the associated rapid transit station(s) and the surrounding area. By capturing key demographic, travel pattern and transit facility information they are a useful snap-shot of the conditions in the hubs for the period reported. Click on the map above to access individual profiles or download all 51 profiles. A summary document describing the state of mobility hubs has been developed as a benchmarking tool to monitor and track change across the mobility hubs over time. This document provides a big picture assessment, summarizing how the hubs are currently performing based on the indicators developed for the December 2015 Mobility Hub Profiles. A second edition of enhanced profiles was released in January 2016. The Second Edition (December 2015) profiles were improved over an earlier 2012 edition by refining and establishing appropriate, reliable indicators and a clear methodology to allow for regular updates aligned with the Census and comparison between future editions. The 2015 Mobility Hub Profiles Methodology documents the approach taken to generate and report each of the indicators used in the 2015 Mobility Hub Profiles. The first edition of the Metrolinx Mobility Hub Profiles was released in September 2012. Note: The data in the 2012 Mobility Hub Profiles should not compared to later editions as the methodologies may not be consistent.